I think this is a bug, but trying to log back in from the client causes the client to hang. After logging off of Crimson from the web applet launch, and then trying to log back in from the client, it just sits there. Well, I've already booched things. I went to play on this new ocean using the link in Hermes' post above. Thinking it was a separate client, I created my Tonyanator character in the Java window that appears on the page. When I finished, it told me I already had the client downloaded. Took me a few moments to find the tiny "family oceans" button, but I finally clicked it and went to log on as Tonyanator from my tkp42 account. Unfortunately, the server told me that pirate had already been created!!! Zomg. What can I do to get my name back on Crimson? On a side note, I'm also very surprised this isn't part of a separate client like Ice. The dub situation is going to be strange, and it will be too easy for lil' chil'ren to click over to Sage, for example, where they will be assaulted by all sorts of naughtiness. EDIT: The web page that allows you to join the Dub Club should have a big banner on the page where you actually click to buy the doubloons that you are, in fact, joining the Dub Club rather than just buying a package of doubloons. I just booched again, and purchased 42 dubs on tkp4208, which will at least give my alts access to Ice, but my Eyedekay name is not purple on Crimson, nor did I succeed in joining the Dub Club and getting the kitty. DANG IT. This is reduced to 75%, but do you see the problem??? That little text link is way too friggin' small. I've used OOO's billing pages lots of times, and I made a mistake and bought the wrong thing. What about folks who are new to the site? They, like me, are going to be ticked off that they bought the wrong thing! EDIT 3: The friggin' savvy hat is for sale on Crimson! Zomg. Okay I have to agree with most of what has beens aid previous to my post. The filter is complete overkill, I was hoping to see some sort of spelling corrector as well as the filter instead of simply blocking anything that is mispelt. Something like "Word auto-correct" which changes the word to the closest thing spelt similarly. The names I have to say I am sad that this issue was not forseen or if it was, have it fixed. No one is perfect even in OOO land I guess. The whole issue with the ocean hoping seems almost suspicious. Making doubloons universal from Crimson to green oceans is just asking for Crimson resident children to go to the green oceans to use their doubloons to play whatever they can;t on Crimson like poker and wagering and rum... whatever they'll do with that. The family ocean button is fairly well hidden so in reference to that I am pleased but let's be serious here this will not be a well kept secret and is sure no safety barrier. I don't necessarly see the need for a different client although I would accept it as the settings are much different on Crimson then any other ocean so the player shouldn't excpect things like poker and atlantis and all that other stuff. I'm not sure if this is already in palce or not but during account creation at some point the player's age is required and anyone under thirteen is then sent to Crimson. This should (if it doesn;t already) create a lock to that "standard oceans" button so junior pirates simply cannot access the login page to over 13 oceans. The dub club seems alright. 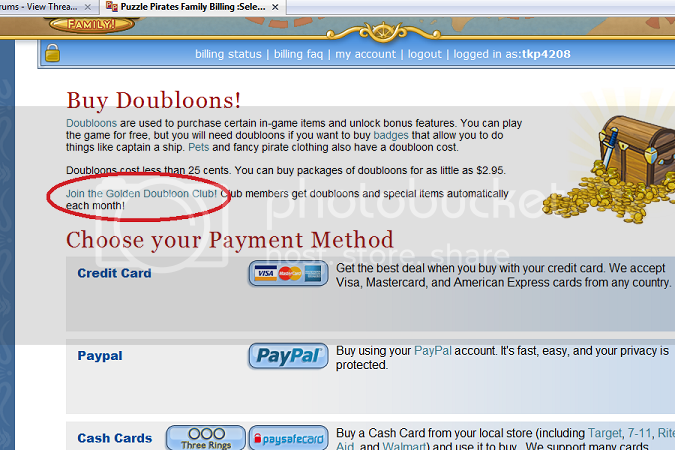 I don;t use doubloons so I would not know the difference but I think the purple name is just a ploy to make people join. Something which prooved to be oh so effective with the /duty and pink greeter names. I really don;t see the point in it and it causes confusion with the whole "are you an OM?" people get for being part of the club. Subscribers don't get a psecial color name? why in the world would you need a tag saying what payment method you use? Since it doesn't affect the game in any other way then socially I guess it's not all that much of a bother but still. Thidly, RUM! Okay I knew it would be tuned down but to remove it completely?! So distilling and distilling shops bite the dust as well? Come on you could have simply changed the damn name to "sugar cane soda" keeping the same art and puzzle and no one would ahve been the wiser. Distilling is not a taboo in itself as far as I'm concerned. Children don't know what distilling in real life does works and what it makes. Hell they might think distilling is how you make soda after seeing it in this game. I just think its a shame to have to kill an industry which thrives at the heart of this game and to significantly reduce the involvement of the distilling puzzle. Hemp oil is still produced but how profitable is that going to be to just sell and produce that. At least ditilling and distilleris aren't completely gone but they aren't far from it. Card games would be nice. Without any wagering of course. I do understand some parents have a taboo about card games but I mean come on where do you cut the line? You have swrodfighting and rumbling. The idea behind thi sis to fight! but card games oh no that's just too far. Poker can go to hell that's fine but I would'nt burn the cards just yet. They are just good fun and it woudl be a learning experience for children to learn how to play something like hearts and spades, they are nice played in family >.> . I understand the wish to remove player vs player hostility and removing war mechanics and stuff. CI and Atlantis though meh it's a little far fetched and removes an awful lot of game material but I guess all of these are necessary cut outs. I am still curious to see what happens to blockading... If its still there at all. Anywho I am eager to see what develops out of this ocean. Without poker and CI and atlantis this is like a flash from the past ocean should be interesting. Wierd Strangers giving kids huggles? thats were i can see it being a problem. Not sure I like the whole Auto Lock on all ships. That will make things very difficult. With all that censoring, i'm wondering what will happen with foreing languages? Does that mean that i won't be able to communicate in french with other french speaking pirates? They should just censor all the known swear words and allow a pirate's name to be typed once it has been made. I don't think a purge is necessarily the answer because it would just create the same vacuum as a fresh ocean, but I do agree that the bar gets set pretty high and is hard to compete against and quickly becomes discouraging. Can we at least PLEASE have some way of trading charts between officers soonish - before they all dust? I don't need multiple interarch charts but my fellow officers want them - and I have no way of giving them to them at the moment. Why isn't trade working just out of curiosity? Can you not leave them on a navigation table and let officers take them from there, just as a short term fix? No, all ships seem to be on perma-lock down. It's funny that "screw you" is filtered, but "go screw yourself" is not. Ouch! Sounds like the bug reports from this ocean will be burying Ceph and Co for a little while. I would like to see the Rum mechanic retained, but with family-friendly names like Root Beer, Sarsaparilla, or even different Juices. I'd also like to add my support for card games. I'm all for eliminating wagers so as not to promote gambling and to prevent kids being taken advantage of, but as a parent, I don't find the games themselves inappropriate. Add mine as another "vote" for a separate client, as well. For those asking that the dictionary be exclusionary (these are the words you can't say) instead of inclusionary (these are the words you can say), remember that the point of an inclusionary dictionary is to make it more difficult for predators to groom kids and get their personal information. Yes, it will be difficult for someone with a reading-based learning difference or disability, but the chat does highlight what is misspelled, so they can try again. That may be frustrating, especially at first, but remember this ocean is subject to COPPA . I'm sure if this is successful, we'll see additional language support in some fashion, either by addition to the dictionary or by addition of servers. I've already set my son up with a wee pirate all his own, and he is very excited to get to play and talk to people. He's played some of the puzzles from my lap on an alt I set aside for him (alchemistry is his favorite puzzle), but he didn't like that he wasn't allowed to talk to other pirates or go anywhere but his shack, the shops, and the mission board. So hopefully for your son you don't mind him playing with all those 'Killers' and 'Slayers' and 'Hotgirls' on Crimson.... ;) (you could even name your pirate '(bad word for women comparing them to female dogs)' or worse....if there is....). The naming filter is booched, too. So far, I've seen Hell, Hellyeah, and Thisoceansux. Srsly (which is also not allowed). Chances are good that while the name issue is being worked on, /complain is going to require a work around. So, if you see an inappropriate name in the meantime, go to Ye -- Help -- Complain and see if it will let you enter the offensive name there. Fill in the rest with "Inappropriate pirate name." Perhaps someone can test that and not actually send the complaint (unless there's a reason to send one), then post back here whether that avenue is open. They're still working on it -- this ocean is in beta. Sometimes, a new thing has to have contact with users before you can find out where it needs work. The developers can better use constructive criticism than sarcasm and pronouncements of "ridiculous". /Agrees with Taelac on being constructive. I am going to worry a lot on the spelling issues with my niece, who, despite learning English for several years, would have serious difficulties to spell perfectly enough (we are Spanish). Implementing some kind of spell-check that can go hand-in-hand with this COPPA thing would be amazing. Helping out finding the problem, giving suggestions, etc, is great. Just whining and criticising will be frustrating for all and lead us all nowhere. I am sure all the OMs and developers are doing their very best. We are helping edit a draft, and it gives us the chance to share the game we luv with those little ones we love. Let's find it exciting and motivating and help out as much as we can! They're still working on it -- this ocean is in beta. That's why I wrote I hope to see it reworked soon. Sometimes, a new thing has to have contact with users before you can find out where it needs work. The developers can better use constructive criticism than sarcasm and pronouncements of "ridiculous". That's a feedback thread, isn't it? Most feedbacks contain personal opinions. Mine is, as I said, that the current filter system is ridiculous as it works by now. That doesn't mean I'm not aware it's beta. Also I read the thread before posting and didn't find that point (names not being affected by the filter while creating) but the other way around (names BEING affected - by chat filter oc). So I thought that worth mentioning... T'wasn't my intention to displeasure you or anyone else feeling uneasy with my choice of words :). I made a thread about this in game design but I think this is the place I should have posted it in to discuss with those who are most concerned. I propose that tutorials, missions and etc should be written in a manner that younger players can understand. There have been some feedback already about it on the thread here. Filtered words show as red in the petitions, but petitions can still be sent in anyways. This. The Family architecture is indeed in beta, folks, so we're definitely plugging away at the filter and pirate name issues that are cropping up. Thank you to everyone who has taken the time to report any problems or omissions they have come across! The inability to use certain commands is an unintended consequence of the whitelist, and one we'll fix. Trading should be enabled on Family oceans, but also appears to be broken at the moment. That will also be corrected. Being a selection that branches off of a regular account, what is there to prevent a child under the age of 13 from clicking over to the non-family accounts and logging on to one of the current oceans? This is something we take pretty seriously, and will be refining our policies in this area in the coming days, hopefully with your input as parents! At the end of the day, however, the bottom line is that we've set out to make the Family servers a place that is appropriate for Puzzle Pirates players of all ages, and we intend to take every step necessary to ensure that is the case. EDIT 3: The friggin' savvy hat is for sale on Crimson! omg. Alrighty! I'll be watching over this thread in the coming days, mates, so keep the constructive feedback coming! I haven't done much testing with chat because everything I type turns red, so I have nothing to say about that other than I'm sure everyone at OOO is working on it. And to people wigging out about distilling, hemp oil can be produced in distilleries, so the puzzle isn't gone. I think adding some sort of beverage for pillages, akin to rum, but non alcoholic would be cute, but it's not necessary for distilling. On Windows, I have two user accounts set up - one for me as the admin and one for my nephews and nieces to use when they are visiting. On their desktop I have placed icons to the games and programs that they are allowed to play. It would be incredibly handy if I could place a Crimson Ocean icon there as well. I prefer having Crimson accessible through the same client, personally. It means I don't have to download something else on a machine with a dearth of memory, and I can change oceans on my account without having to switch clients (that slows my machine down and often leads to necessary reboots). Perhaps for your nieces and nephews, you could log into Crimson on their login first, setting it as the default ocean for when they use it? Also Hermes mentioned that they already have a way to limit family ocean accounts to just the family oceans. This might be accomplished by having the ability to direct a shortcut to a specific ocean. On windows this would be accomplished by adding -Crimson or -Family (for example) to the end of the Target field, and would then restrict access to only that ocean (or type of ocean). I'm not sure how this would be accomplished on Linux of MacOSX, but I'm sure there's a way. I like this idea! A different client with a different icon would smooth over some of my worries about letting my son play. Another note I saw was that someone was annoyed that the dubs transferred from the main oceans to Crimson... I must admit I'm a bit annoyed by this too. Kids have difficulty understanding the consequences of using all the available features; last night, for example, my son accepted the free Jade/Crimson Release gift & trophy on Crimson because it was a pretty shiny button to push... (I was very annoyed by this,) but in his mind he was doing nothing wrong. A separate client that the main account could transfer dubs to would be ideal I think. Is there some sort of way we could make a separate control for how many dubs are available on Crimson vs. the main oceans? My son has requested that card games be allowed on Crimson.